With “Old Florida” charm and brand new furnishings this home is nestled among sego palms and sea pines. 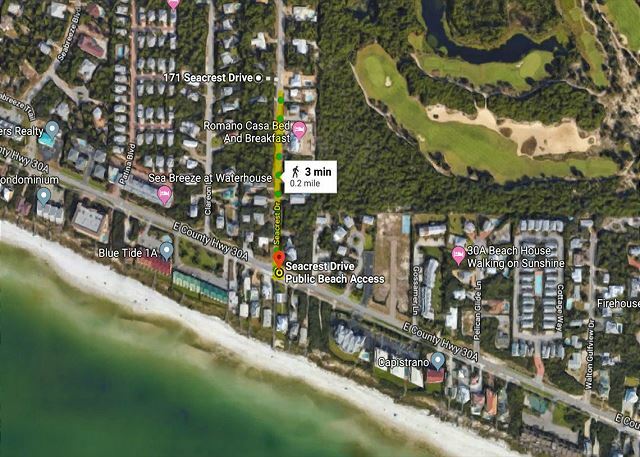 Conveniently located just off 30A in the heart of Seacrest, Florida , on a quiet, dead-end street . This 3 bedroom, 2 bath newly renovated home, comfortably sleeps up to 6 guests. Upon entry, you will be greeted with an incredible open kitchen, dining and living area . Gorgeous flooring pours throughout the house generating the perfect balance of beauty and warmth. Fully equipped kitchen with large island, new granite countertops and new stainless steel appliances are a cooks dream. This home has a mudroom with a stackable laundry center, utility sink and barn door to block any sound from the laundry. Movie nights and leisurely lounging are a must in the large living area with a 65” flat screen TV, with Mediacom cable, Netflix account, sound bar and cozy sectional . A beautiful master suite with a king size bed, flat screen tv with cable and updated bathroom with walk-in shower. The second bedroom features a king size bed and flat screen TV for streaming . The cozy bunk room is perfect for kids or adults with a swivel mounted flat screen for streaming and fun. Hall bathroom features a tub/shower combination. Just a 5 minute stroll will take you to the deeded beach access at the end of the street, where you will find the sugar white sand and the emerald water of the gulf coast . Located less than one mile from the surrounding communities of Alys Beach, Rosemary Beach and Watersound, 171 Seacrest puts you within a short walk , bike ride, or drive to fun family activities like The Hub, delicious restaurants, desirable boutiques and more! Or if you prefer to spend a quiet evening cooking at home you can do so in the peaceful confines of the surrounding pines with ample outdoor seating! Though no beach view this property is a reasonable and straight stroll to the ocean. The street and boardwalk are charming which makes a pleasant stroll, or adult bikes provided make a quick lunch break back to the house. This location is perfect right between Alys-Rosemary and Seaside. Best of all the sunlight pours into a brand new living and kitchen area with gorgeous hardwoods and fantastic kitchen. My family of two was extremely comfy, but the house could reasonably entertain 6, even 8. I marked down slightly due to no beach view and construction in progress. Also notable is that the steps to the beach are very steep like most in the area, but this also protected the homes wonderfully from hurricane surge. (Neighborhood construction in progress as of 10-2018). Thank you for submitting your review. This is a beautiful and charming home!! And while you cannot actually see the beach from the property - just a few minutes walk right down the road and you will behold one of the most beautiful sites you will ever see - the emerald waters of the Gulf coast! White sand and gorgeous sunsets will keep you relaxed and invigorated! After spending a tranquil day on the beach you can return home to your comfortable couch, prepare a delicious meal and just be happy! Call Benchmark today - let us take care of you and your family - we can make beach vacation dreams come true!